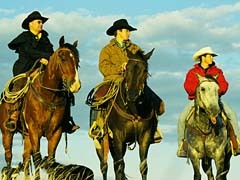 Many people come to Alberta, Canada looking for the cowboys... the horses... the cattle... the lifestyle of the old West. It may not be like in the movies, but there is definitely a ranch culture here to experience. If this is something you are interested in, read the following article for some great inspiration! At the Howard ranch, it’s pretty much always time to cowboy up. This is the real thing pardner – marked by hard work, love of the land and adversity. This is not the silver-screened version of Alberta... of low, rolling hills where the Oscar-winning movie, Unforgiven or Legends of the Fall or Open Range were shot. This is not where the Rocky Mountains provide a snow-kissed background to dude ranches nor where the Cowboy Trail cuts 700 km through some of Alberta’s prettiest ranchland. This is dinosaur country, a.k.a. the Badlands – and for good reason. Look out the Howards’ kitchen window and beside the pen of fluffy new calves, you’ll see dusty coulees and flat-topped buttes. “Gumbo,” grins Don Howard, whose family has farmed this particular swath of land since 1944, describing the dry cracks in the land that can turn into a boot-sucking quagmire in rain. In other words land that was too bad to farm and wildly tough to travel through (mako, land and sica, bad) aptly named by the Sioux natives. The land here in Southern Alberta, which most associate with the largest cache of dinosaur fossils found on Earth, speaks to the people who toil it. On the Howard table are whispers of land-locked treasures. Two smooth rocks used as tomahawks lie next to a Libby’s pickle jar of wheat farmed in 1952 that won second prize at the Toronto Royal Fair. Poke around their farm a bit and you’ll spot dozens of buffalo heads decorating barns, mantle tops and entrance ways. Teepee rings have been found on this ancient land. Ammolite in nearby riverbeds. And dinosaur fossils – everywhere. 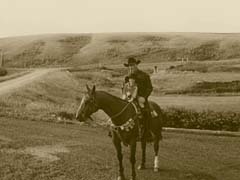 While Alberta’s sprawling cattle kingdoms were being developed in the 1880s – mostly west and south of Calgary – ranching in the area near Drumheller didn’t begin until the late 1890s when a certain Mr. James Russell is said to have climbed off the train in Calgary, lured west by government-backed promotions that were giving away free homesteads. The story goes that he filed his claim and then walked 240 km to arrive here as did so many other Irish and Scottish settlers. Just as Don learned the ropes from his father who began homesteading in the Handhills area in 1916, he shares his spread of 10,000 acres of grain, 250 head of cattle and 12 horses with his two sons, Darrin and Wade, and his daughter Donalee. Bouncing east along Highway 570, we spot eight pronghorn, two coyotes, hundreds of cattle, the skeletons of classic old red barns and the stubble of golden wheat and I think Don’s right. Of course today you don’t find bulls or oxen breaking the land but the same prairie sunsets still stain the sky, homemade rhubarb pie still tastes sweetest out here and the value of time and chit chat is as poignant as ever. Talk to Johnny Caswell in Drumheller’s Continuing Care Centre and he’ll spin you poems about lovin’ cowboy life . . . oiling up his saddle, shoeing horses, getting ready for round-up, riding to school on either Rusty or Darky, the whiff of roses and Wolf Willow in the spring. Or, to Ed and Russell Peake whose poetry-spinning grandfather, Arthur, moved to the open range here in 1906. Russell remembers his frugal grandparents making only two trips a year to a store. In 1901 Gleichen was THE place to shop so they’d go there by horse and buggy to buy 100 lb. sacks of flour, sugar and precious rations of bacon, coffee, baking powder and tea. The original log house of their grandparents still stands in the tiny hamlet of Dorothy, right next to the community hall which once rocked to the tunes of Bobby Hoy’s Orchestra, Jack Cuncannon’s band, and the Peake band. Electricity didn’t make it to Dorothy until 1958 so the two Peake brothers remember reading by coal lamps that their grandfather wouldn’t let them turn up for fear of having to clean the soot off the lamp’s globe. And so the stories go – of people still connected to their land. Of people who measure time by the price of beef, of droughts, and SARS and BSE. People who prefer to use horses (not quads) at round-ups, who remember what a dough god (?) was, and how they got to miss half a day of school in 1952 – that’s when Rosy from Chicago came to Dorothy to see if there truly were as many wealthy bachelor/farmers as her newspaper had reported. These are the sort of farmers who’d talk to you if you just pulled up to their combine or tractor - or would invite you to watch a branding, a small-town rodeo or a round-up. So, if you’re heading to Drumheller this spring or summer, don’t make a beeline for the Royal Tyrrell Museum of Palaentology or Rosebud for its small-town dinner theatre. Look around and you’ll likely see farmers like the Howards and the Peakes ridin’ the range on horseback, roundin’ up hundreds of calves for branding (typically in June) or moving cattle to summer grazing grounds. Get out of your car and feel that warm prairie wind roll waves across a field of ripening wheat. Then lean over that fence and talk to a farmer. Remember, this is not where Butch Cassidy or the Sundance Kid once rode (that was at the Bar U, now a historic site) but this is indeed cowboy country and it lives on in the Badlands. Just as do Arthur Peake’s poems, like Sodbuster, in the Ballads of the Badlands. That folks may all have bread to eat. No matter how the wind doth blow. You can settle around a campfire with a bunch of buckaroos and enjoy cowboy poetry like Peake’s – all over Alberta, but the biggest public crooning takes place at the Gathering in Pincher Creek in June. If you want to stay at a ranch in Central Alberta, top picks include Red Deer River Ranches, The Outpost at Warden Rock, Bent River Ranch Adventures, TL Bar Ranch, Ride the Wind Ranch, Rolyn Hills, Echo Coulee Guest Ranch and Rustic Ridge Ranch & Lodge. 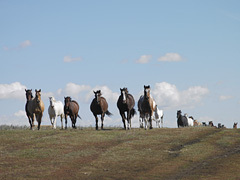 There are also many ranches in Alberta that offer cattle drive packages such as Willow Lane, Lucasia Ranch, Mountain Meadow and Brown Creek Cattle Camp.